Another batch of thirteen episodes from Matt Groening's cult animated series is coming to Blu-ray this December. 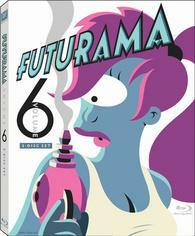 In an early announcement to retailers, 20th Century Fox is prepping 'Futurama: Volume 6' for a Blu-ray bow on December 20. The 2-disc set will contain 13 episodes in 1080p with a DTS-HD master audio 5.1 soundtrack and supplements include: Audio commentaries, Deleted scenes, Professor Farnsworth's "Science of a Scene", Reincarnation Explained! featurette with director Peter Avanzino, and Futurama F.A.Q. (Frequently Axed Questions). You can find the latest specs for 'Futurama: Volume 6' linked from our Blu-ray Release Schedule, where it's indexed under December 20.